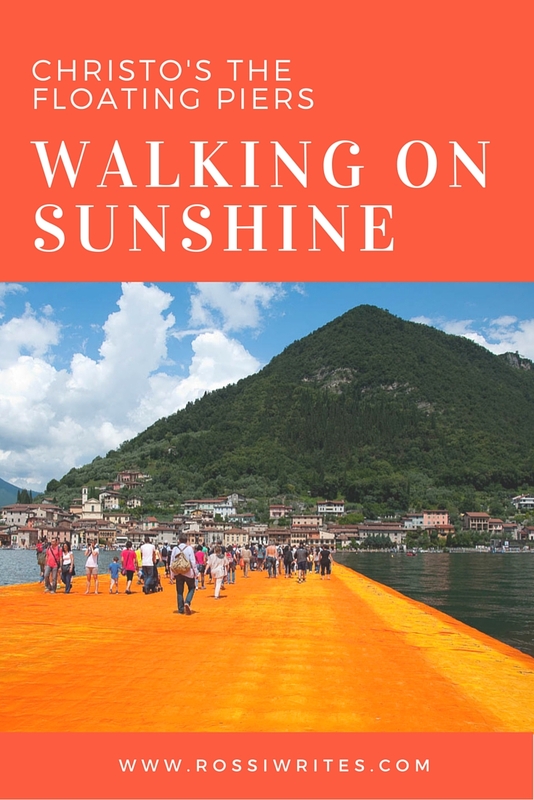 This is the story of how we walked on water on Lake Iseo in Northern Italy. 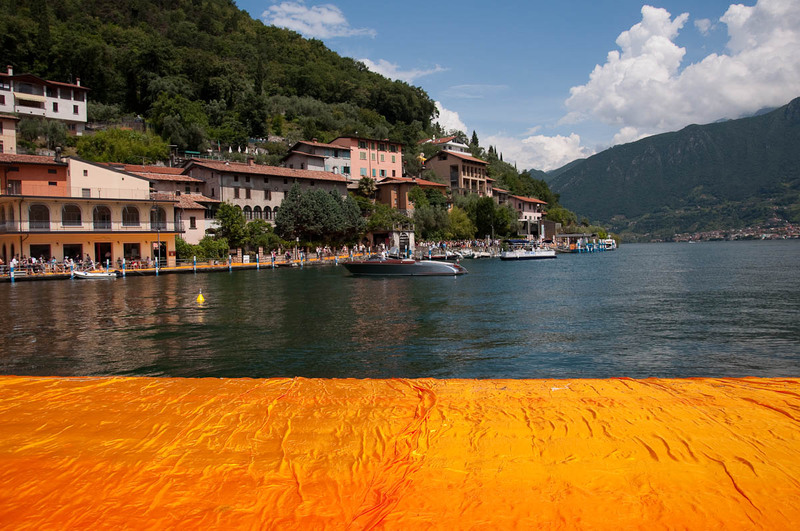 It was all made possible by the creative vision and endeavour of two artists – Christo and Jeanne-Claude. It was an emotional journey across the lake for me and I have shared with you everything I lived through that day in four parts. They reveal the sensation of walking on water, the emotions I went through, some details about the project and some practical information how to get there and what to expect. Read on (or scroll through) to what interests you most. 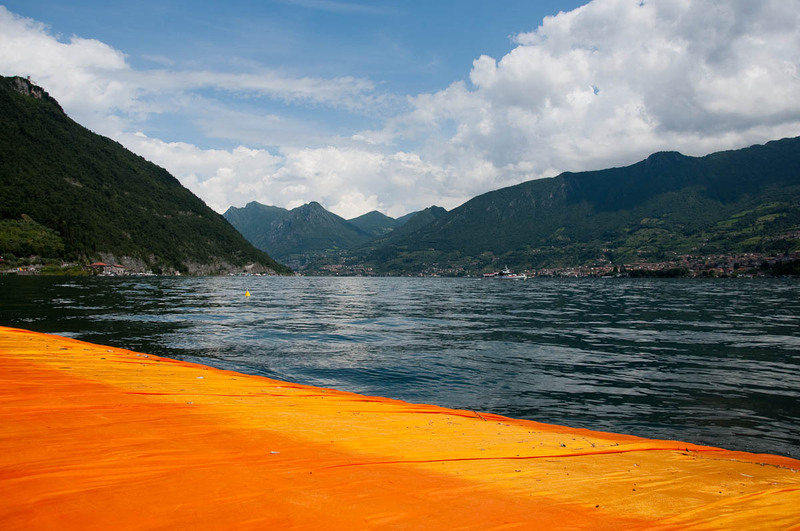 I have included lots of pictures too, to give you a visual idea as to how striking The Floating Piers are. We were walking across the lake. The water underneath our feet gently bobbled up and down and we could feel it undulating with every step we made. 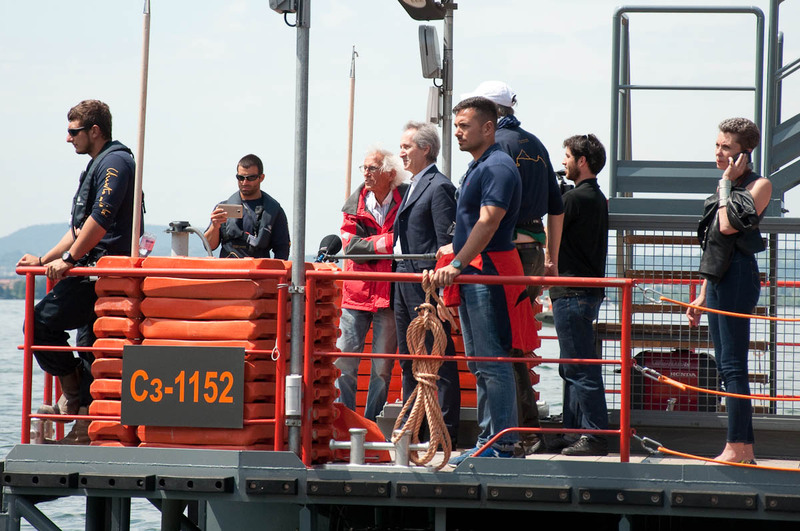 It was like being on a small boat where you are as close to the water as possible without getting wet, but we were not confined to a small hull. Instead, a long and wide walkway in the bright colours of the sun connected the shore we had left behind with the shore of the island ahead of us. In theory it was surreal, yet walking across the lake and feeling it move felt really natural and safe. 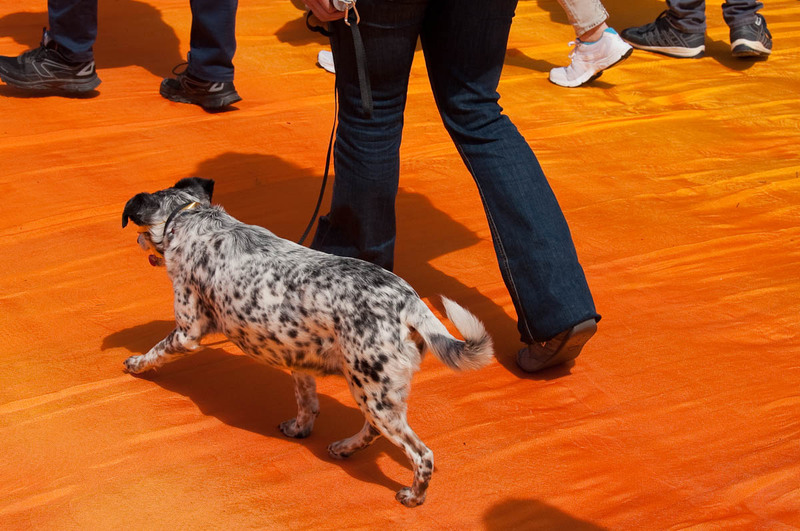 Thousands of people around us followed the orange walkway step by step. 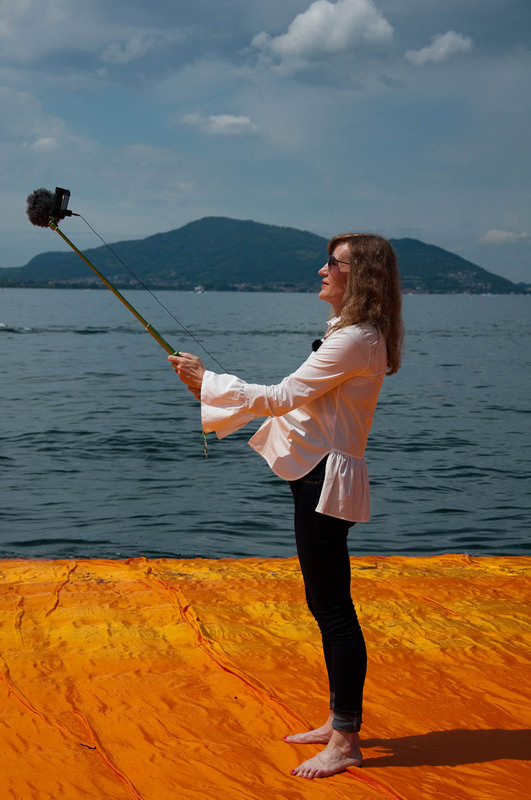 We had come to Lake Iseo that morning from all over Italy and all over the world to take part in an extraordinary thing – an art installation built to make reality out of the ultimate human dream. To walk on water. To remain standing up where you cannot help but sink. Yet from the first moment our feet touched the walkway, we felt like walking on water was the easiest, most pleasant thing in the world. People were leisurely walking around, following the orange line across the lake, stopping to take countless pictures and selfies, chatting animatedly away with their relatives and friends. Ability was not an issue. Babies in buggies strolled easily ahead. Elderly people walked with a steady step. Wheelchairs glided on the surface of the walkway. Even man’s best friend was there, on a leash, also taking part. A couple of ducks stood on the edge of the walkway watching us all walk. It was as simple as that. One big walk. From shore to shore, under the rays of the sun. 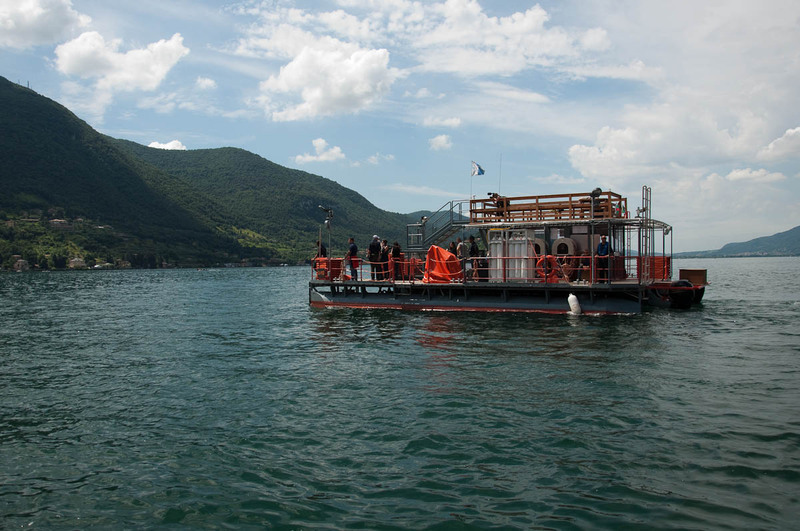 Surrounded by the waters of Lake Iseo which reach 90 meters at their deepest point. Flanked by tall hills. Under the Italian sky. It was a simple experience, relaxing and meditative, convivial and happy all at the same time. We were at one with nature and at the same time we were part of a high technology dream. It was a beautiful sensation. The one of feeling part of something special, the one of being at the right place at the right time, ultimately the one and only feeling of being alive. 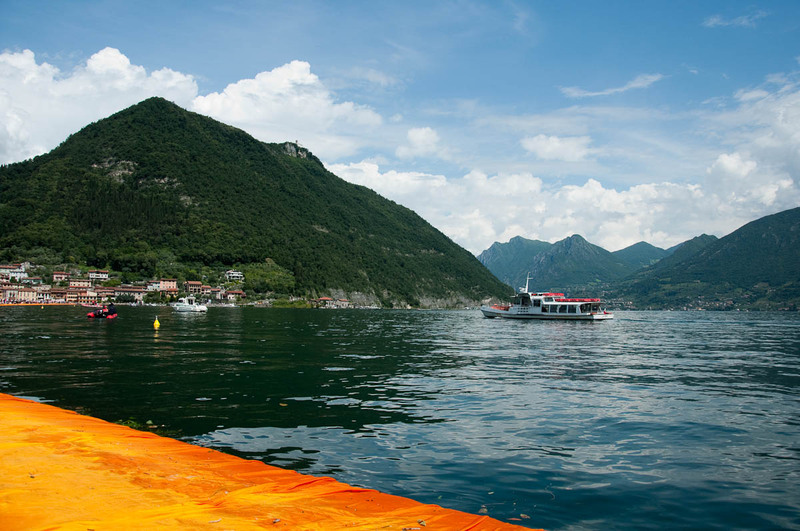 We were nearing the shore of Monte Isola – the island in Lake Iseo to which the orange walkway led – when a watercraft came into view. It was a strange combination of a glass platform and a catamaran. There were several men on board. The people on the walkway had eyes just for one of them. People cheered and clapped. The man with the long white hair and the red jacket on board of the watercraft seemed to be engrossed in his conversation. We all knew who he was. 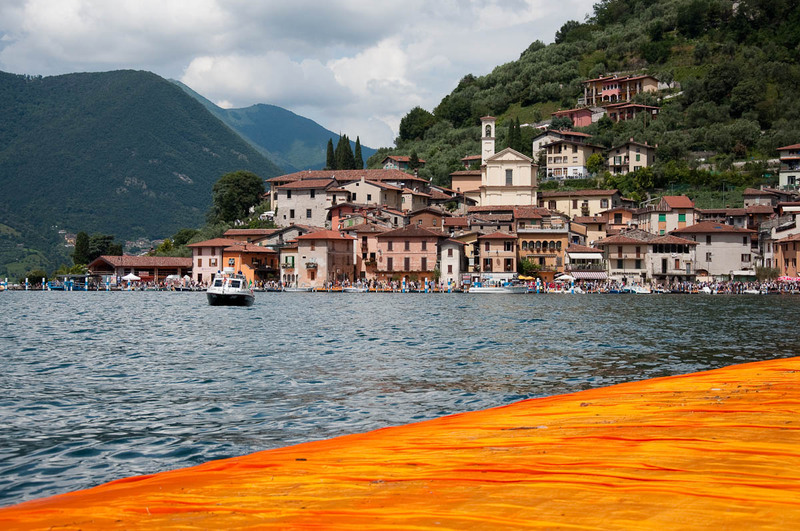 Christo – the artist who together with his late wife Jeanne-Claude had dreamt for the past 40 years or so the installation we were now walking on. The man who had packaged up buildings and planted umbrellas on both sides of the Pacific. One of the few Bulgarians who had had the courage to escape the Communist regime – a risky and very dangerous endeavor which meant that you and your relatives were forever blacklisted. 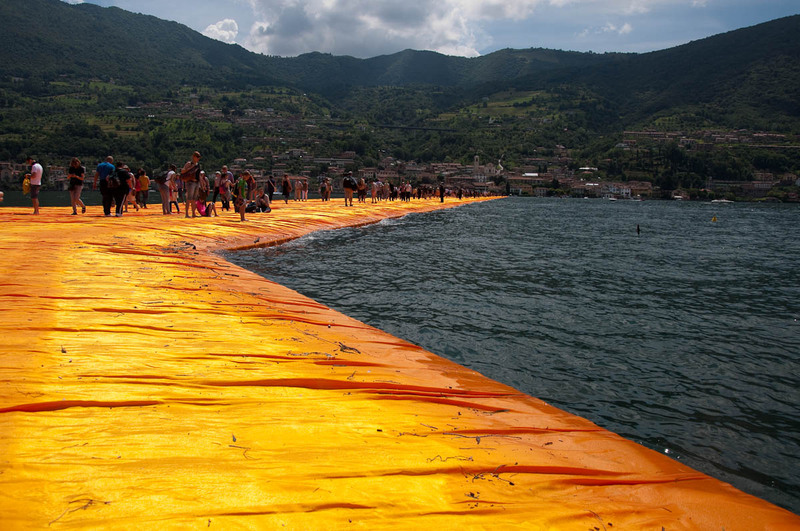 Growing up in Bulgaria I had never heard of Christo. Even though (I found out only recently) he had been respected as a painter and artist in his birth country, after his escape across the Iron Curtain in 1957, officially he was never mentioned again. 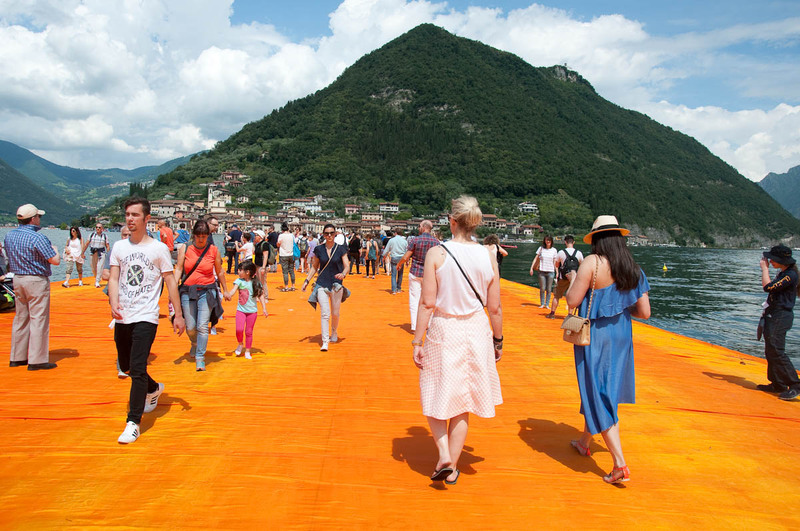 Walking on the orange walkway – part of ‘The Floating Piers’ installation of Christo and Jeanne-Claude – I finally understood my father’s words. Through my toes and heels, I feel the gentle movement of the water. I connect with the lake. People around me keep moving back and forth. 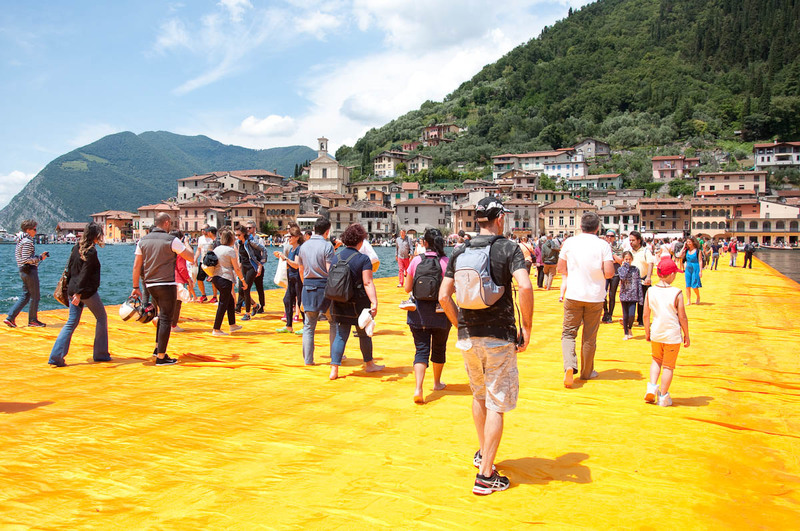 We are only walking, nothing much, yet with our presence there, right on the water surface and firmly stepped on the orange walkway we have become part of the floating installation. Together the piers and the people have become art. Right by Monte Isola at the end of the first stretch of the orange walkway we come across a TV team. Two reporters speak rapidly and emotionally. 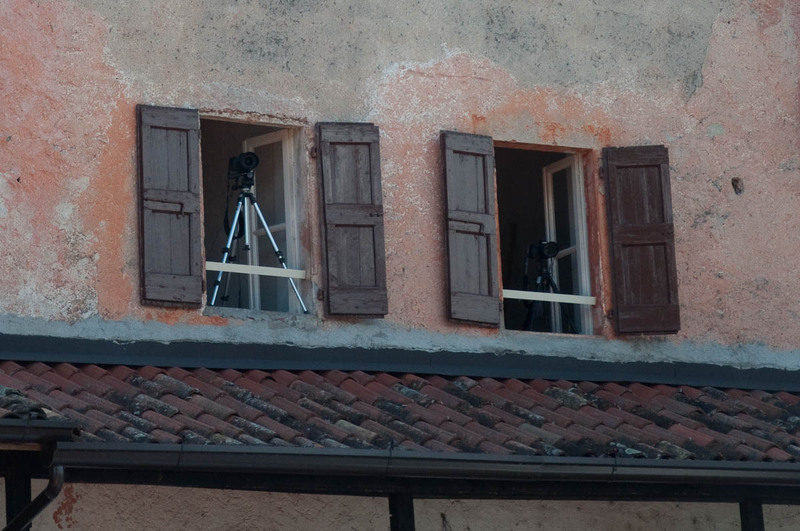 A cameraman with a portable broadcasting station on his back beams their excited dialogue straight into TV sets all around Italy. Both reporters are Bulgarians. The blonde lady is from an Italian TV station. She conducts an interview in Bulgarian with her counterpart (who works for one of the largest TV stations back home) and then quickly translates her words into Italian. We stop to watch. Then quickly realise that many of the people around us, who also eagerly follow the Italo-Bulgarian exchange, are my compatriots, too. Once her interview is finished, the reporter from the Bulgarian TV station is pleased to meet us all. We take photos with her and then a group of Indian tourists arrives and want their photo taken with her, too. She laughs and tries to protest, asking them why they need a photo with her. ‘You are very beautiful’, they tell her, we all laugh and the photo is taken. 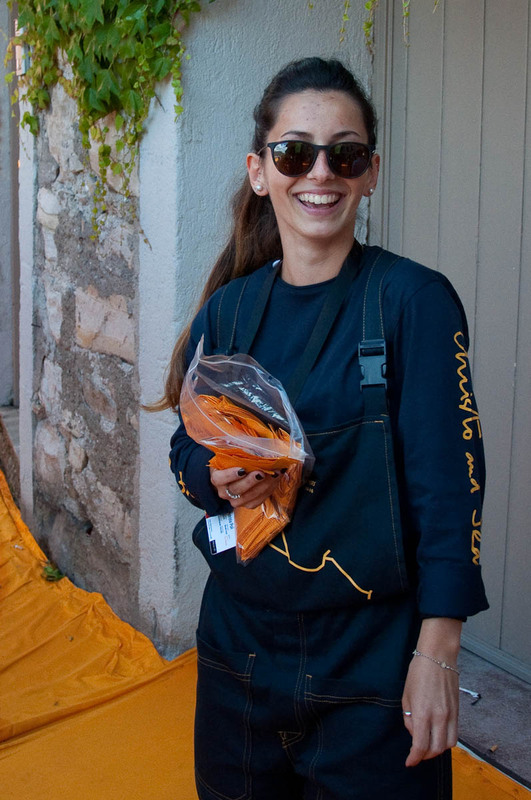 The reporter interviews us all, her compatriots she has met by chance in Italy. 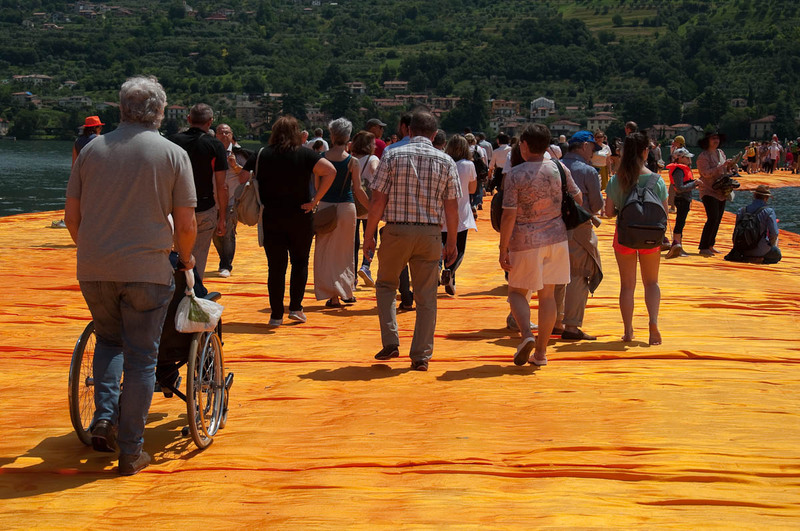 A man and a woman tell her that Christo’s installation is the first time that the Italian media has said something positive about Bulgaria and the Bulgarians. Usually, they explain, we are only represented in the local media in terms of criminal activities and such. Listening to it all, I feel very emotional. A wave of that strong feeling of missing my homeland and being proud of it is about to completely engulf me. ‘Are you OK, darling? !’, my husband says when he sees my teary-eyed look. I nod. It is not surprising that when my turn comes to answer the reporter’s questions, I get too emotional and talk too much without saying much at all. I keep thinking that I need to describe the sensation of walking barefoot on the orange walkway, but instead I get sidetracked. Tired of listening to my gibberish, my little daughter, whom I am holding in my arms, puts her little hand over my mouth. No wonder then I didn’t make the final cut in the Bulgarian TV station’s evening news. My mum tells me that they didn’t show me and I feel relieved. Funnily enough, earlier in the day I got stopped by the team of the Italian newspaper La Repubblica. I end up making their cut, even though what I said had been trimmed down to a sentence and a half. If you want to have a look, it is all below. I am the third person interviewed at 0:44 seconds. 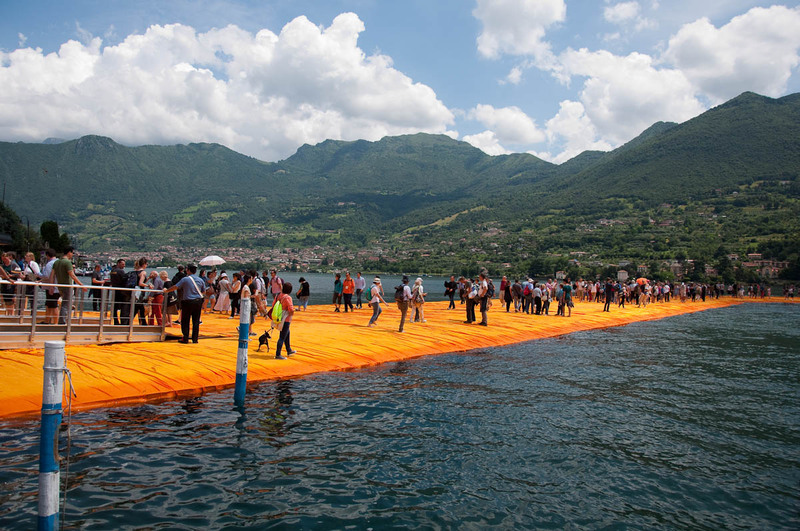 The Floating Piers were conceived by Christo and Jeanne-Claude in 1970. Forty-six years later, the project is now reality. 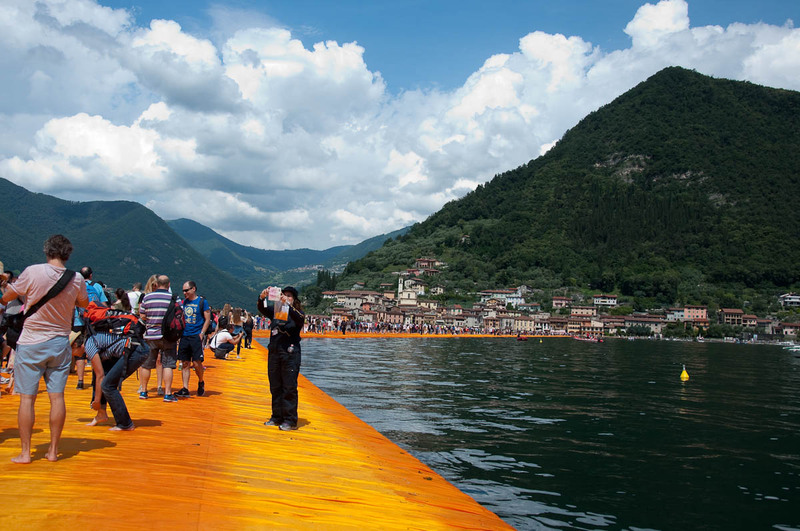 The Floating Piers are a beautiful series of orange walkways allowing people to walk on the surface of Lake Iseo in Northern Italy for two weeks – from the 18th June to the 3rd July. 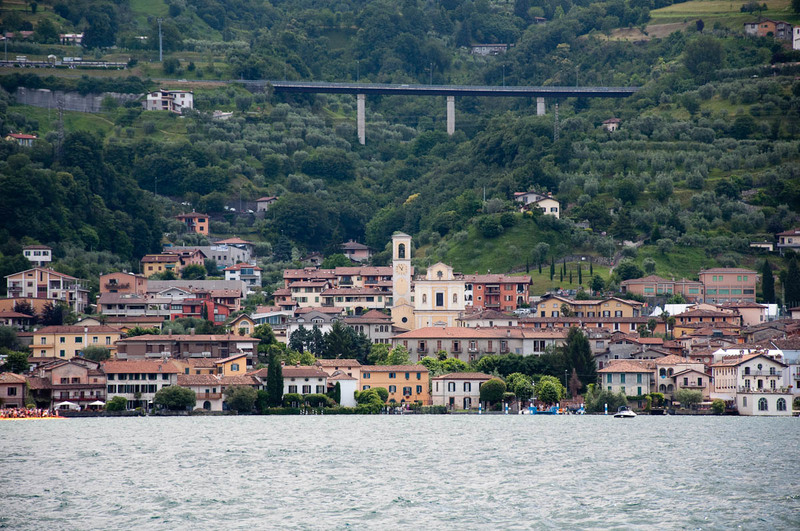 They start from the town of Sulzano and lead you to Monte Isola – the island in the middle of the lake. From there the walkway continues to the nearby private islet of San Paolo which it circumnavigates to return to Monte Isola and from there back to Sulzano. In total, the piers are 3 km long. Each pier is 16 meters wide, making them easy to navigate in spite of the large groups of people. We were there on the first day and according to data released in the media, over 50 thousand people visited the installation then. In spite of this, the walkways felt wide and uncrowded with the biggest concentration of people observed on Monte Isola on the way to the next portion of the piers. The piers have sloping sides and the stewards stationed at regular intervals alongside them ask people not to stand and/or walk on the last 1-1.5 meters of the walkway right by the water edge. There are also several rescue and police boats patrolling the edges of the walkways. 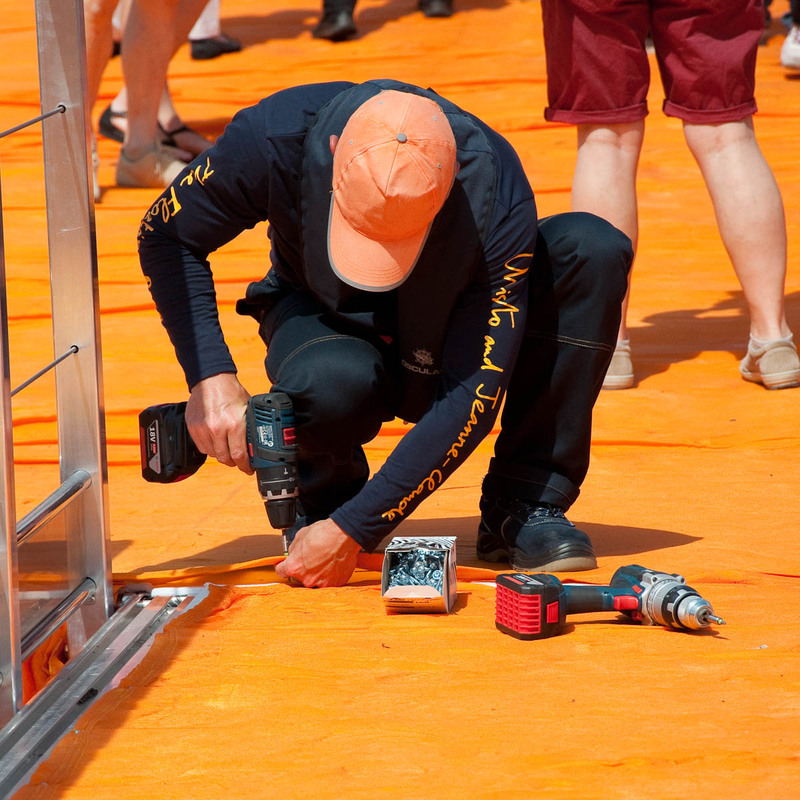 The stewards and other people working on the project wear a black uniform and their sleeves are marked with the words ‘The Floating Piers’ on the right arm and ‘Christo and Jeanne-Claude’ on the left arm. 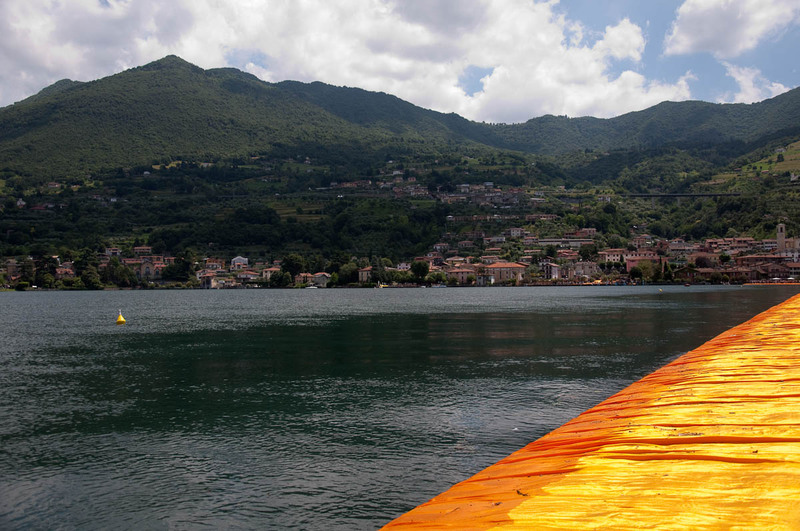 The piers are covered with 100 000 square meters of bright yellow fabric and the sunlight produces rich orange, red and gold hues through the day. 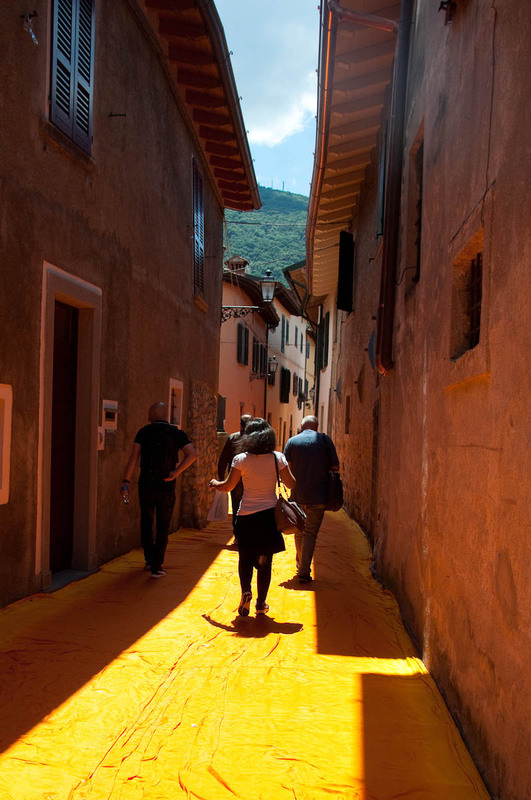 When we were there, the walkways looked orange in the sun, hence I have described them as ‘orange’ all through the text. Little squares of the fabric used to cover the piers, are being given free of charge to the visitors of the installation. In fact, walking on the piers is free of charge, too. You don’t need a ticket or a booking, you just need to turn up. I have provided information about parking and shuttle buses in the last section of this blog post below. 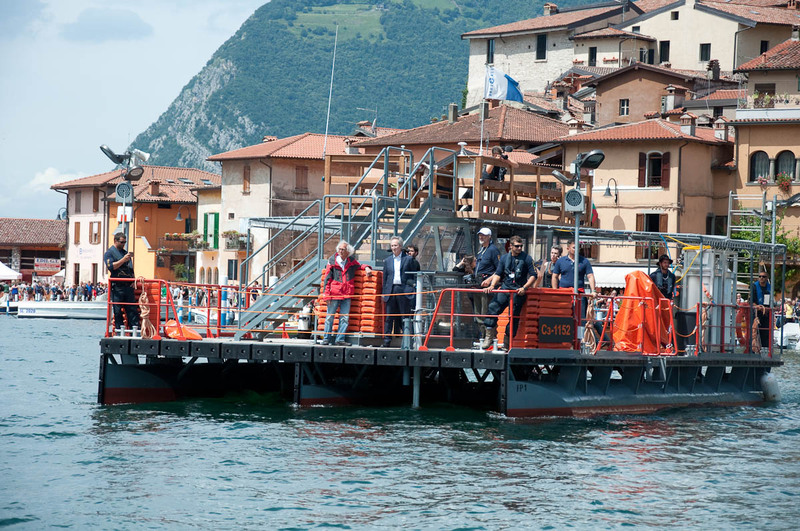 In any case, check the official social media account of The Floating Piers before you head their way. Temporary closures are possible depending on the weather. There is also a live webcam stream, so that you can see at any time what the conditions are. 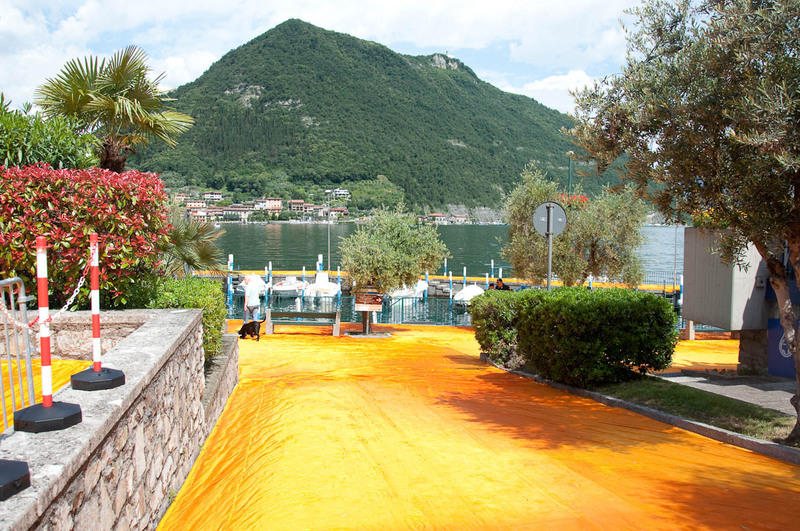 Whole streets of Sulzano and Isola Monte have been covered with the orange fabric, too. This creates a stunning visual effect. People were freely sitting down and even lying on the piers and the towns’ streets. Patches of the walkways were wet, but don’t worry about getting yourself a bit wet by kneeling on them. It is all part of the experience and by touching the fabric with your hands, you feel even deeper the organic whole character of the piers. Obviously, don’t cause congestion. 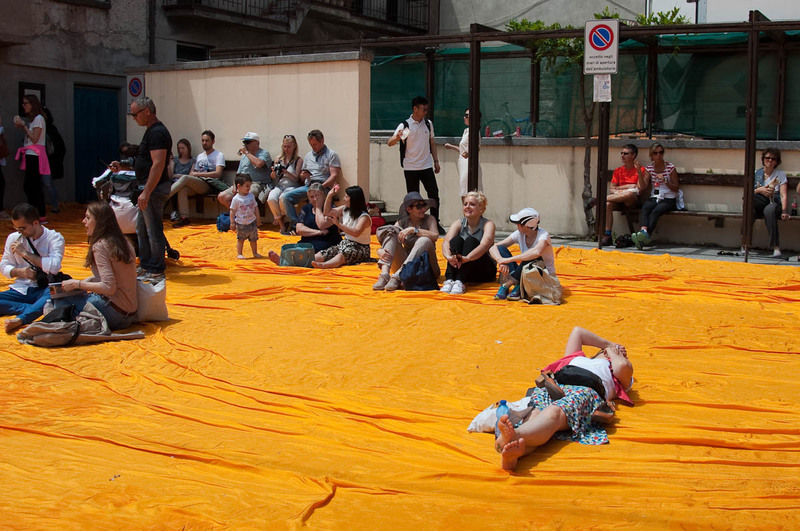 The best way to experience the installation is to walk barefoot or just in your socks on it. Many people walked in their shoes. I took my shoes off after the first ten-twenty meters and the difference was pronounced. I could feel the movement of water underneath and this enhanced the excitement and the emotions the orange walkways built-up in me. I enjoyed observing several local people and their reactions to the huge amount of strangers who had materialised literally in their backyard. The locals were simply getting on with daily life, be it by reading their newspaper whilst the world was walking on water right by them or be it by taking their children onto the mainland without having to wait for a ferry to transport them there. The locals seemed to wear large passes on their necks saying ‘Resident‘, which I found quite curious. 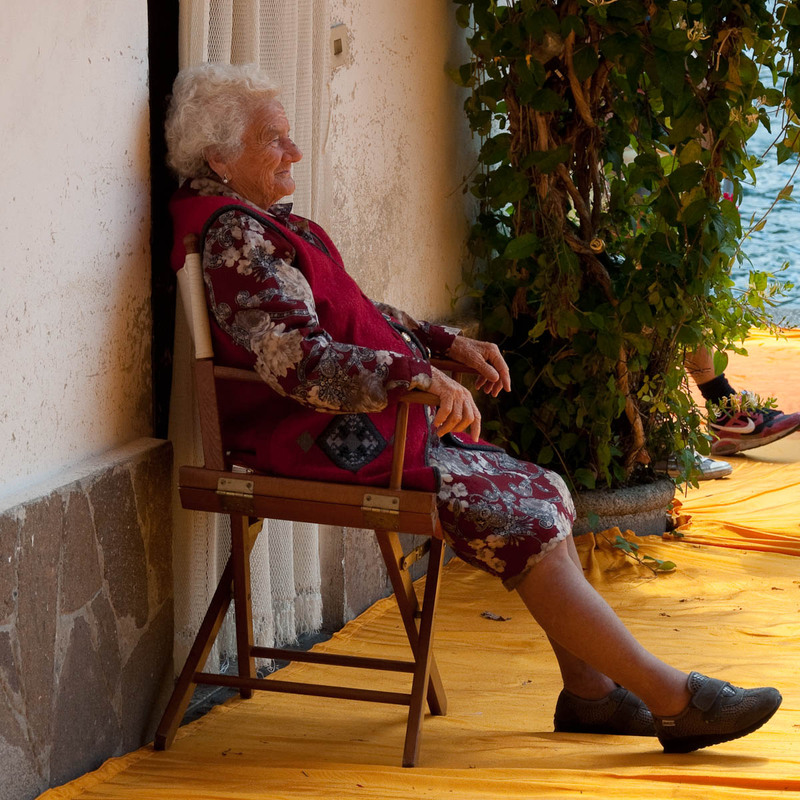 And I loved meeting a sweet old lady on a street covered in orange on Monte Isola. She was sitting on a chair in front of her house, smiling to every child who passed by. 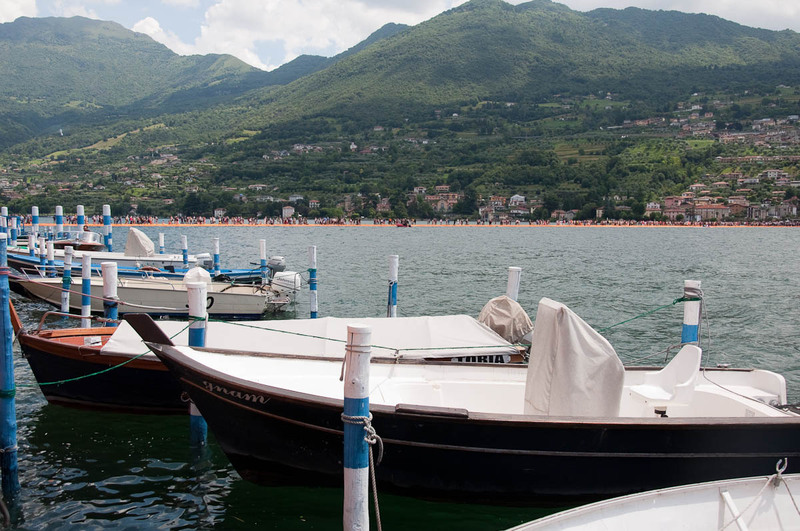 We traveled from Vicenza to Lake Iseo by car, so the information below is based entirely on my first-hand personal experience. I truly hope that your experience would be better than mine. People are also reaching Sulzano by train. 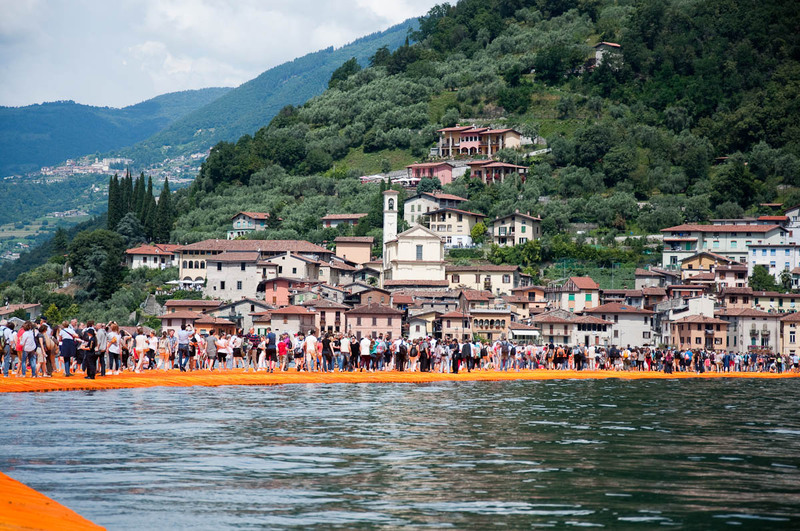 Unfortunately, I don’t have any first-hand information to share with you about this option so it is best to check The Floating Piers’ official website here about this. So, if you drive to Lake Iseo, you will need to leave your car in one of the specially set-up parking lots and then get a shuttle bus. The car parks costs between 15 and 20 euros, which, in all honesty, I found a bit excessive. The shuttle bus return ticket is 5.50 euros per person. 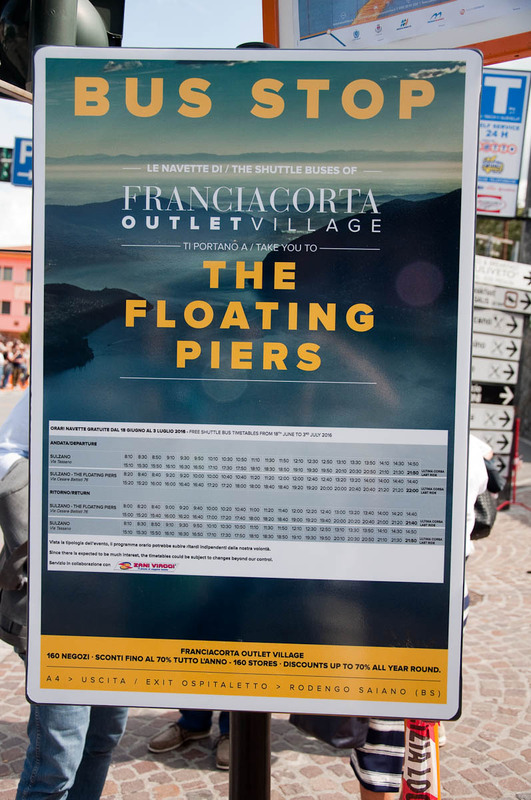 It needs to be pointed out that The Floating Piers derives no income from parking. We reached the lake at 10:15 on Saturday morning – the first day of the installation being opened to the public. The car park we found was already almost full. There was a big queue of people waiting for the shuttle bus. A white gazebo by the start of the queue had been set up and this is where the tickets were being sold. We bought our tickets and queued, expecting to spend there at least an hour. Just then a very long bus came, but instead of stopping right by the start of the queue, it stopped several meters down the street. A man in a very nice expensive-looking suit ran from the end of the queue towards the bus and then all people ran like mad trying to squeeze themselves in. The shuttle bus picks people from several stops along the way, so when it reached us, it was already pretty full. Somehow, we managed to get on, guarding our little daughter from all the pushes and shoves. It wasn’t a great experience, I am afraid. People were a bit edgy and not everyone managed to get on the shuttle bus. Plus, the shuttle bus was so full, it didn’t stop on any more stops all the way to Sulzano and I saw several large groups of queuing people looking really disappointed under the hot sun. I have posted a picture of the shuttle bus timetable below for your interest. The journey from the car park to Sulzano took about 15 minutes. Soon, through the windows of the bus we could glimpse the orange lines of the piers far ahead of us in the lake. A wave of excited murmur ran through the shuttle bus. 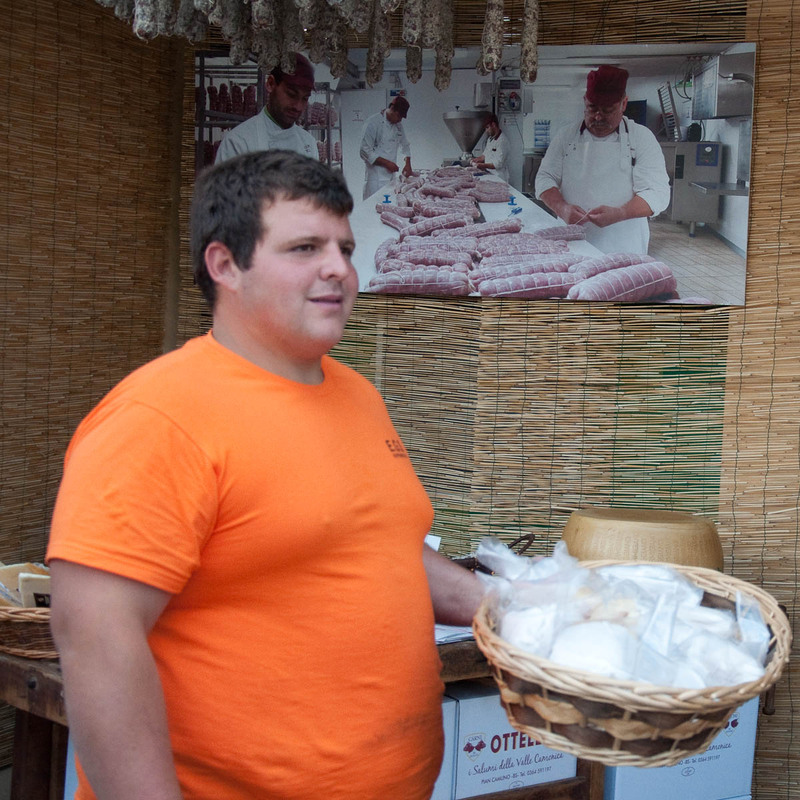 Upon arriving in Sulzano, we were met by sales assistants from the nearby shops, who were holding baskets with sandwiches, ice-creams and drinks selling them to the eager tourists. 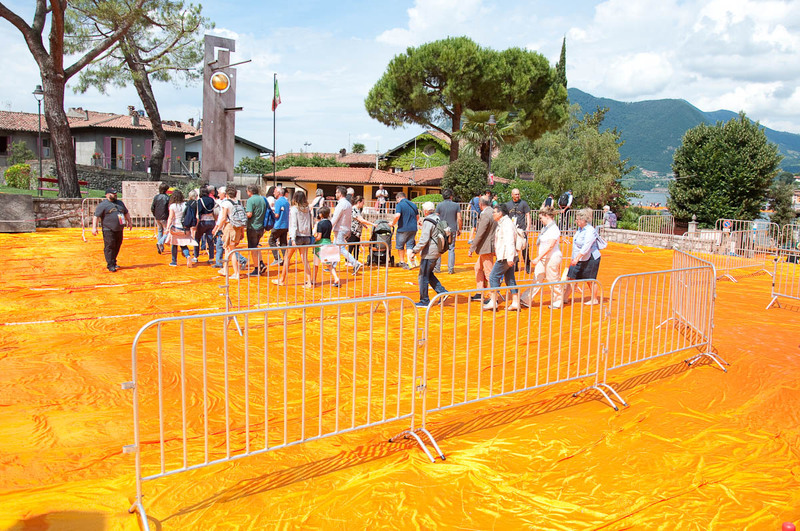 It is expected over a million people to visit the installation until the 3rd July, so the local shop owners are doing what they can to meet demand for food and drinks. 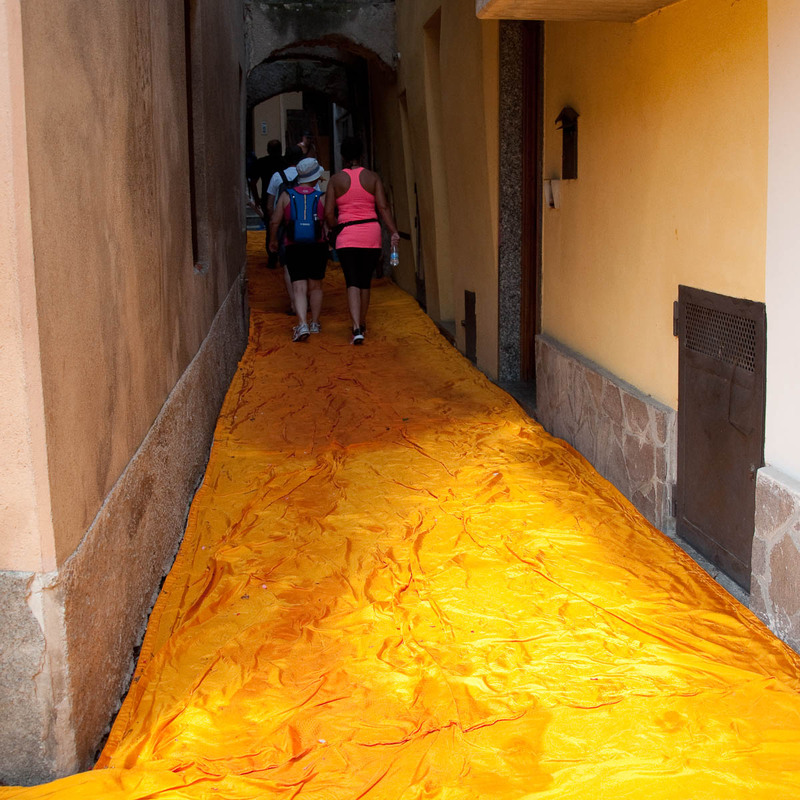 Once in Sulzano, you just need to follow the orange colour of the fabric covering the path leading to the lake. (Especially for parents) There is a nice playground right by the entrance to the orange walkway. In any case, walking across the lake is an exercise enough in itself. It can get really hot on the walkway, so we found that sun cream and hats really helped. Buggies and wheelchairs are allowed. There were several people with their dogs. All but one dog I saw were muzzled, even the tiniest ones. Our experience was overwhelmingly positive. The rush for the shuttle bus and the overcrowded conditions on board were not pleasant. Once we saw and walked on the piers though, we felt really happy and emotional, so it was all worth it. 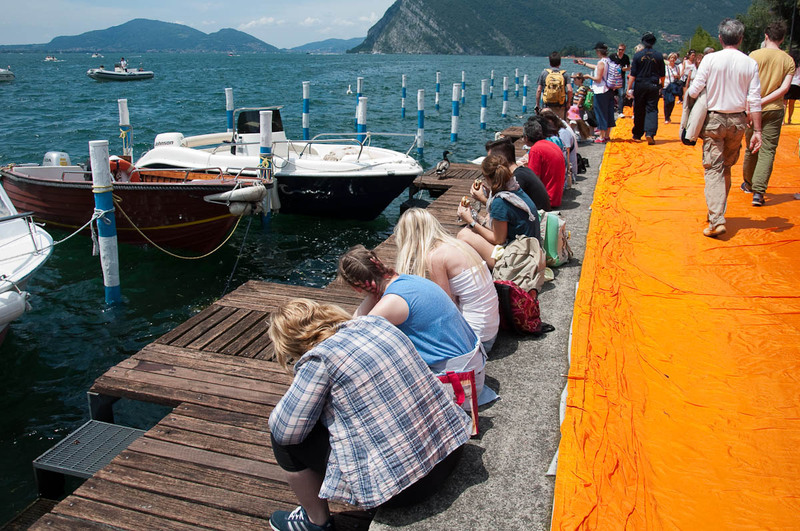 If you have a chance to visit The Floating Piers, grab it with both hands. It is a one in a lifetime experience and such an amazing thing to see. Incredibly beautiful, too! 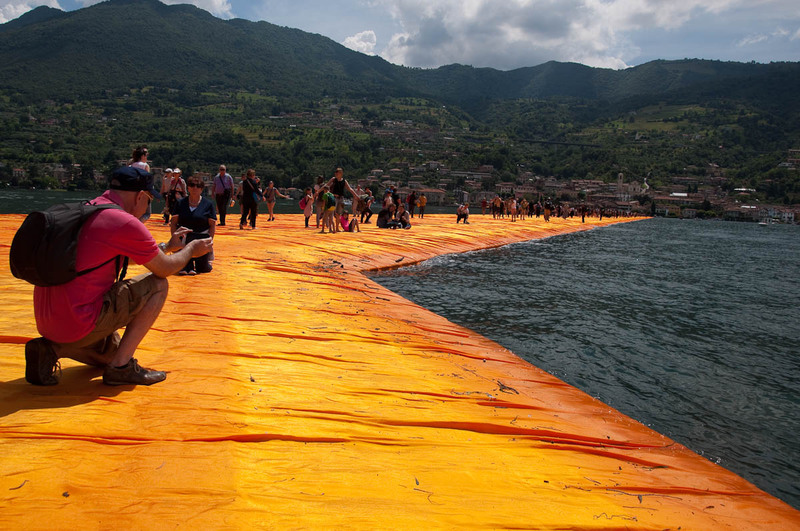 Thank you, Christo and Jeanne-Claude for the artistic vision and for making it happen, too!